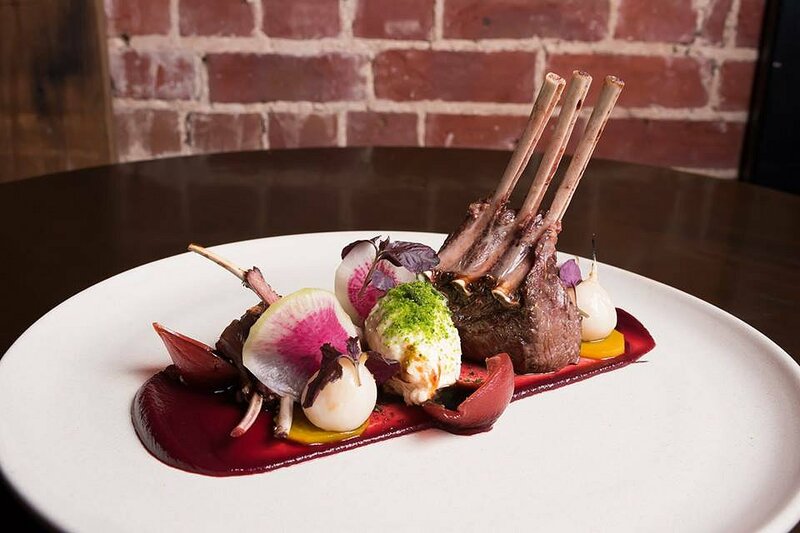 Last Thursday for lunch, Adelaide Food Central was invited to sample the menu new at the Publishers Hotel. Head Chef Callum and his wonderful team served us a mix of rustic and colourful foods that kept our taste buds dancing. The first was Scallops & Pork Belly which had fennel, avocado, orange lemon myrtle gel and chorizo soil. Two of my favourite foods joined into one dish, what more could I want. 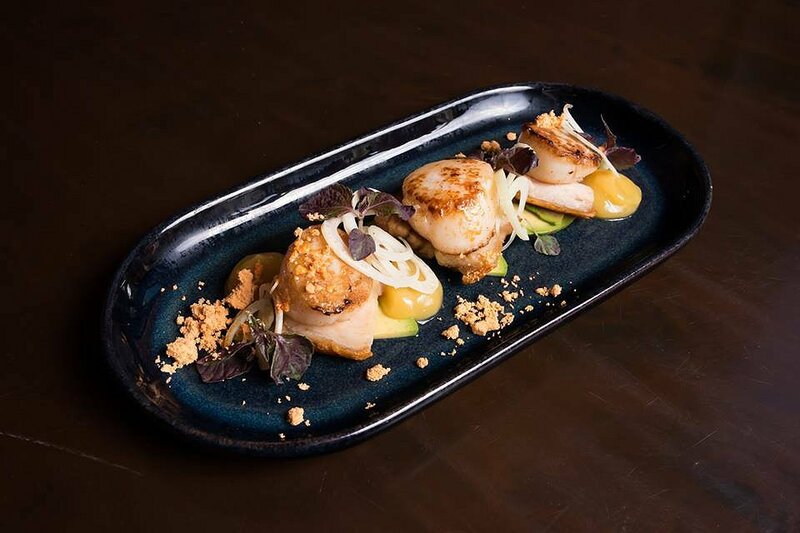 The scallops and pork belly complimented each other perfectly, both cooked to perfection. The avocado gave the dish a little bit of a creamy texture and paired well with the acidic elements from the orange lemon myrtle gel. 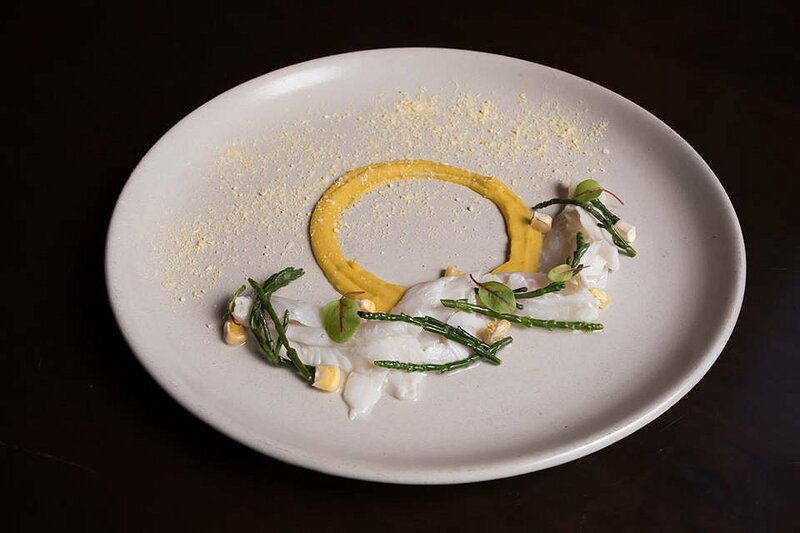 The second delicious entrée we were served was the King George Whiting Ceviche, which came with riberry foam, sapphire and sweet corn puree. For those of you that enjoy raw fish and sashimi this is the dish for you. Such a light and simple recipe but with so much flavour. The sweet corn puree helped to give the dish the sweet element it needed, along with the sour component from the foam. 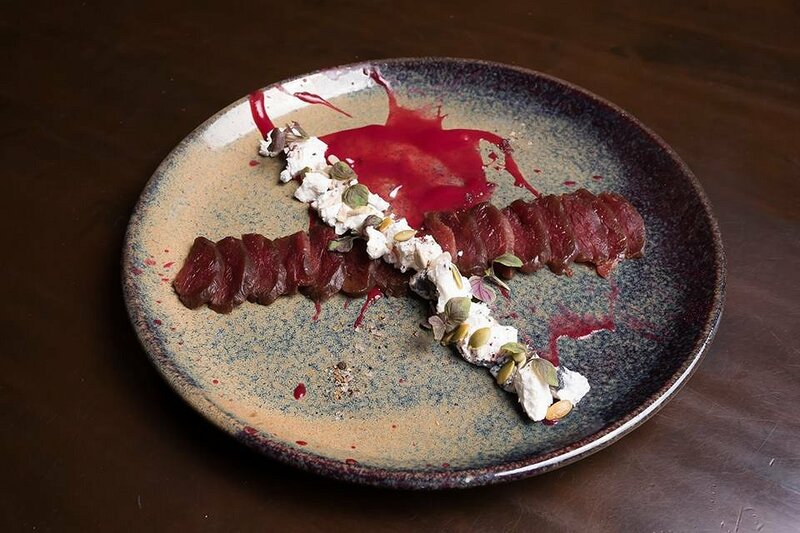 The final entrée that we tried was the Semi Cured Red Kangaroo which came with Davidson plum sauce, Woodside ashed goats chevre, seeds and wattle seed. I loved the fact that this dish incorporated goat’s chevre and kangaroo, as both the creamy and gamey elements complimented each other. The sweet flavours from the plum sauce helped to give the kangaroo a sweet twist. The first main was the Venison Rack with port and beetroot puree, heirloom beets, barilla, horseradish mousse, beetroot pickled cocktail onion and jus. When this dish came out we were shocked with how amazingly pretty it looked. We didn’t want to eat it as it looked like a pretty little garden. The meat was cooked to absolute perfection and the veggies were fresh. The overall dish reminded me of a fancy Sunday roast. 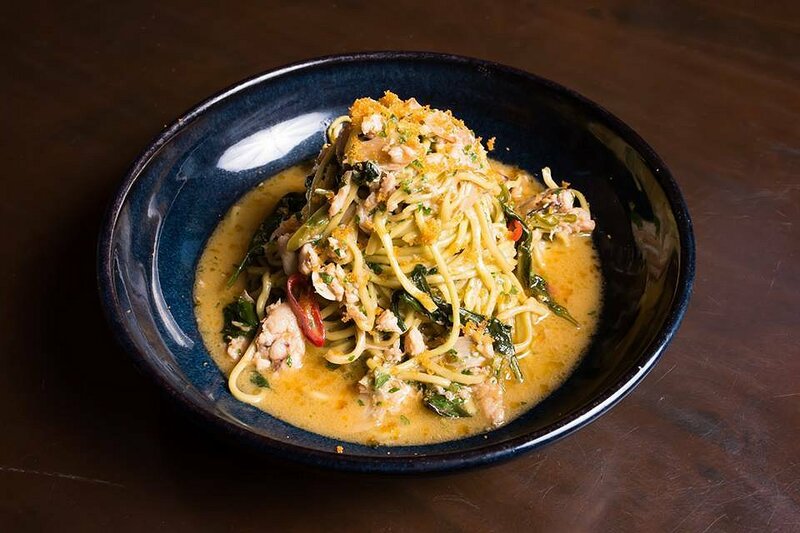 The second dish was the Blue Swimmer Crab Spaghetti with parsley spaghetti, garlic, chilli, warrigal greens, dill soil and bottarga. This was by far my favourite dish of the day. The one thing that caught my eye with this spaghetti is that you could see the generous amounts of crab distributed throughout. A lot of restaurants can be rather stingy with seafood but this was far from the case in this dish. The chilli was not too overbearing and the awesome flavours from the garlic, soil and bottarga made the dish a hit. 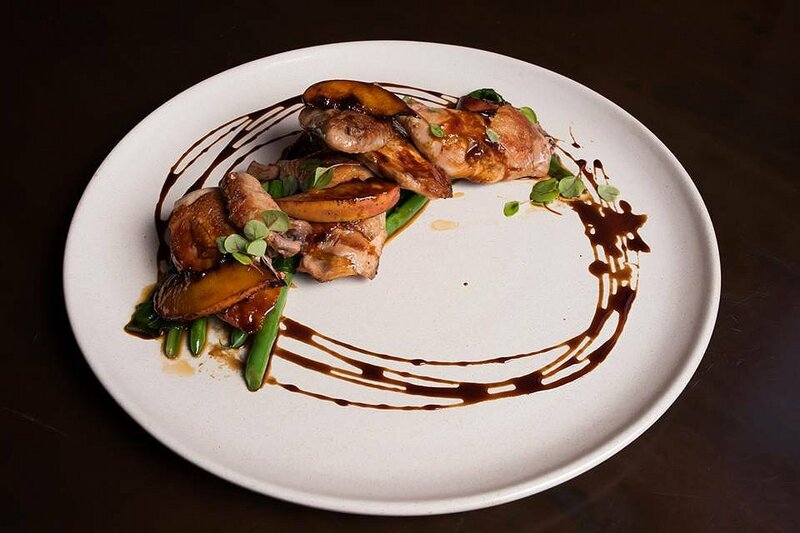 The last main menu item we had was the Twice Cooked Poussin with Warrigal greens, green beans, caramelized peach and Boobialla fruit glaze. This delicious chicken dish was extremely hearty. My favourite part was the sweet peach, which we have seen in a few dishes of late. The chicken and peach paired well together, as the chicken was subtle and the peach sweet. It was a great dish to finish off our mains with. There’s so much to love about the Publishers Hotel; whether it’s the heritage building, the cosy atmosphere, the excellent service, or the upmarket meals on offer. This place really ticks all the boxes. We would love to thank the staff and the chef’s at the Publishers Hotel for inviting us along to sample their awesome menu, we can’t recommend it enough!